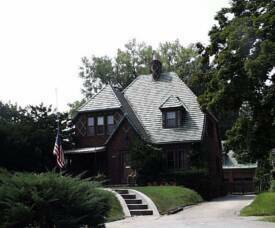 The Field Club Residential Historic District in south central Omaha Nebraska is located approximately three miles south and west of the central business district and encompasses approximately sixteen square blocks. The historic district consists of three hundred twenty eight houses, primarily owner occupied single family residences. The district is bordered by Hanscom Park, the oldest park in the city of Omaha on the east side, the Field Club on the west, Center Street on the south and Turner Boulevard on the north. The streets in this neighborhood are laid out on a grid pattern with the exception of Turner Boulevard that curves around to conform to the Park and Boulevard System pattern. Woolworth Boulevard is considered the main street of the neighborhood and runs east/west with a large central green space and stately homes on either side of the road. 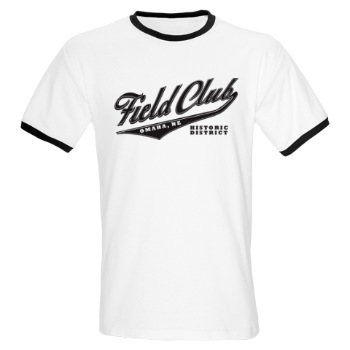 Woolworth Boulevard terminates into the Field Club at the west end and Hanscom Park on the east end. Building construction in this neighborhood covers the gamut of twentieth century building styles. Ranging from early 1880s Victorian Era buildings along the Park to mid-century, post World War II cottage style and modern style dwellings. Early settlement in this area began with well established Omahans moving out of downtown to newly established subdivision accessed by the trolley car system to make it a more attractive area. Later development attracted executives from the Livestock exchange business in South Omaha and the neighborhood was completed from the 1920s through the 1940s with developers purchasing whole blocks of land to attract a wide variety of home buyers including GIs returning from their war service. Although the houses in the Field Club neighborhood vary in size, scale, and age, the quality of construction remained consistent throughout its developmental years ranging from 1889 to 1950. Commercial development has not been allowed to permeate the neighborhood over the years. The only non-residential buildings in the neighborhood are the Field Club School and the Westminster Presbyterian Church. Overall, this neighborhood retains a remarkably high degree of historic integrity with only eight non-contributing buildings of the total 312 buildings in the district. There are three main construction eras found in this district. Beginning with the earliest development of the Queen Anne and Victorian Era houses facing the Park, followed by the largest building boom around 1910 and extending through the early 1920s. A definite break in development is visible during the late 1920s and 1930s with the neighborhood finally building on all available lots after World War II where entire blocks were developed. Various styles illustrate the construction eras throughout the district with many newer homes representing simple minimal traditional styles and variations on the American Foursquare. Following is a description of the various styles represented in the district. 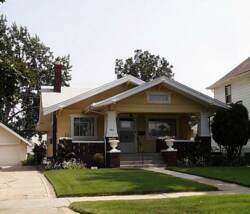 They are primarily represented by the major early developments along 32nd Avenue and slightly later along Woolworth Boulevard, the variations on Revival Styles primarily applied to the basic Foursquare plan, and the post World War II minimal traditional and cottage styles. The following representative examples are not a complete listing, but those that best represent or most uniquely represent their stylistic definition. Queen Anne style was popular during the Victorian Era, which extended from approximately 1830 to 1890. 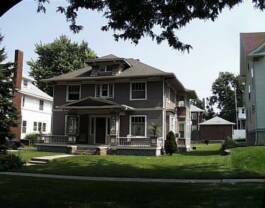 This tradition saw its highlight in Nebraska toward the end of the era with most Queen Anne style houses being constructed between 1880s and 1900. This style saw a blending of many others with profusely applied ornamentation that was widely available thanks to technological advancements. The earliest houses in the district represent this building type and are located facing Hanscom Park on 32nd Avenue. These buildings are representative examples of the Queen Anne because of their asymmetrical floor and roof plans, rounded turrets, wraparound porches, and their variety of cladding materials that will include shingles and clapboards. 1602 South 32nd Avenue built in 1890 is a 2 ½ story home with a rounded wall that provides the illusion of the often seen turret. The home has a large brick chimney, ornamental shingling and elaborately detailed porch supports. The steeply pitched and highly irregular roofline adds to the asymmetrical nature of the style. 1608 S. 32nd Avenue is of similar construction. It is a 2-½ story building with clapboard siding. The variations in wall material on this home come in the way of applied appearance of half timbering not only as applied ornament, but also divided the stories of the home. A large front porch with turned posts and balusters define the main façade. A strikingly tall brick chimney projects from the steeply pitched asymmetrical roof. 1624 S. 32nd Avenue (pictured) is arguably the most elaborate Victorian Era house in the neighborhood. It employs the typical adornments of the Queen Anne with fish scale shingles, elaborate front porch, and applied moldings; however these design elements are applied to a cross-gambreled roofline combining the elaborateness of Queen Anne styling with the more conservative Dutch Colonial roofline. This eclectic nature may be the most distinctive characteristic of Victorian Era buildings. Period Revivals were popular in Omaha primarily during the first thirty years of the twentieth century. Period Revivals included Jacobethan, English, French, Spanish, Pueblo, Mission and the Tudor Revival. These styles all borrowed freely from historical antecedents primarily through the application of ornamental detailing. 1122 Turner Boulevard is a Mission/Spanish Revival built in 1909 and designed by F. A. Henninger. This large stucco house has an arched parapet wall that projects above the roofline providing the primary feature of the Mission or Spanish Revival. This house is located on Turner Boulevard the only curvilinear street in the neighborhood and has a large front porch with curving stairs. The Colonial Revival Style was popular between 1890 and 1930 and developed as a reaction to the applied ornamentation and asymmetry of Victorian Era tastes. 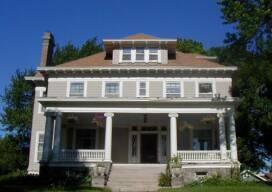 Colonial Revival styles harken back to early American architectural styles that are based on simple, symmetrical building plans, classical details and Palladian windows. Colonial Revival styles varied from Dutch Revival Spanish Revival and English Colonial. These styles are differentiated by roofline, cladding materials, and applied ornamentation. Most notable in Colonial Revival style houses is the steady appearance of formal entrances enhanced by doorhoods, columns, and pilasters. The following examples are located throughout the neighborhood and represent the wide array of Colonial Revival details from Dutch Colonial to Mission or Spanish Colonial. 3559 Woolworth Avenue built in 1924 was designed by the well-known Omaha architecture firm of Leo Daly for the Outman Family is a simple rectangular plan with a side gabled roof with dormers a symmetrical elevation with tripartite windows on the upper level. The main entrance is enhanced with a door with sidelights and overhanging hood, columns, and pilasters. 1327 South 35th Street is a Dutch Colonial Revival built in 1910 and designed by Withnel for the Henry Horning family. 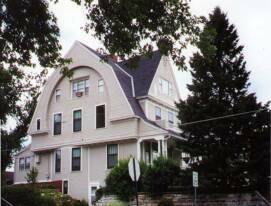 This house has a side facing gambrel roof. The symmetrical façade is enhanced with formal central entrance with a door and sidelights and overhanging doorhood. 1305 South 35th Street was built in 1904 designed by W.T. Misener and built for the James Ainscon family. This more ornate example has a side facing gambrel roof with overhanging eaves running along the main façade that is enhanced by a wide shed dormer along the roofline. The ornate central entrance has a projecting partial width porch supported by paired ionic columns. The dominant Colonial Revival style represented in the neighborhood appears to be the Dutch Colonial. Although no evidence is available it is possible that the large number of Dutch Colonial styles were taken either from local or nationally known pattern books. They are similar in scale and massing and materials and closely resemble those found in pattern books of the late 1910s and early 20s. Approximately ten Dutch Colonials are located in the neighborhood all within close proximity of each other around 35th Streets and Hickory Street. Classical Revival or Neoclassical styling and detailing infiltrated architectural design during the entire first half of the twentieth century. Massive full-height columns with symmetrical facades and geometric detailing along the cornice lines are keynotes of the style. Columns tend to be fluted with Ionic or Corinthian capitals. Cornice line detailing consisted of dentil moldings, large modillions, and wide fascia boards. Formalized entrances were not uncommon and large doors were enhanced fluted pilasters and sidelights and fanlights. Quite often pediments would detail windows and dormers. The best example of Classical Revival styling in the neighborhood is located at 1728 32nd Avenue (pictured). This house was built in 1901 and designed by local architect F.A. Henninger. Henninger utilized ionic columns on the full-width front porch along with a formalized entrance with sidelights and fanlight. As is typical the house has projecting eaves with heavy modillions. This is the only house in the neighborhood that closely adheres to Classical detailing, although there are many foursquare plans with classical detailing applied in windows, doors, and cornices. Chateauesque is a style that saw limited popularity in this neighborhood and in Omaha generally. 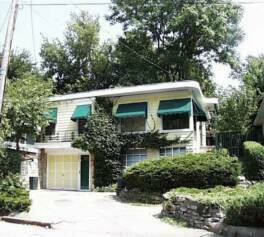 This style was quite rare on a national level as well and was often reserved for large architect designed estates. It is based on chateaux found in the French countryside. However, one house constructed at 3520 Woolworth Boulevard illustrates some of the stylistic details of the Chateauesque. These houses will have steeply pitched roofs with through dormers helping to provide vertical detailing. Façade details are found in cladding material and windows and doors are often ornamented with shallow relief carvings, Gothic tracery, and stone mullions. Quite often these openings will be shallowly arched. 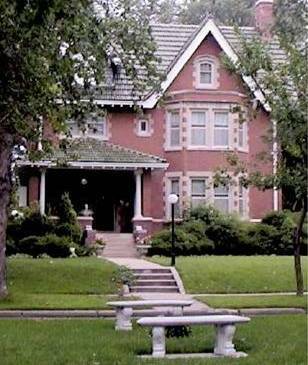 The W. A. DeBord House was designed by John McDonald, a well known Omaha architect, who designed many of the most impressive houses and commercial buildings in the city including the George A. Joslyn Castle (listed NRHP 1972) and the Joslyn Art Museum. The house was built in 1907 and is a 2-½ brick building with a steeply pitched clay tile roof. The style is epitomized through the carved stone window surrounds and the asymmetrical façade. 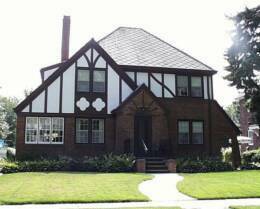 Tudor Revival borrowed freely from medieval design details. The primary features of this style are an irregular plan, steeply pitched roof slope (often with curvilinear details) and most notably faux half-timbering. One of the best examples in the neighborhood of this style is located at 1130 Turner Boulevard built in 1908 and designed by F. A. Henninger for the R. D. Pollard family. This massive house has an expansive roofline with large shed dormer and a recessed front porch. Brick construction enhances the first floor while the second level boasts the requisite stucco with half-timbered details. This building has a matching contributing garage that echoes the stylistic Tudor Revival details with steep roof, shed dormer and half-timbering. 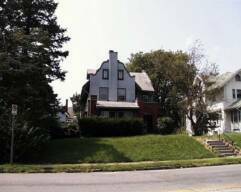 This house is located on Turner Boulevard, the only curvilinear street in the neighborhood and has a large setback with expansive front lawn. F. A. Henninger designed 3316 Woolworth Boulevard, built in 1927, for the W. A. Woodard family. It is a large 2-½ story cross-gabled house with a partial width offset porch entry. The stucco and half-timbering are located in the gable ends of the second story with the rest of the cladding consisting of bricks. The home at1100-1102 S. 35th Avenue was built in 1926 and has a central entrance with full height French doors with shutters opening onto small wrought iron railings with a symmetrical façade, pyramidal roof and central dormer. This house represents the French Period Revival with its simple wrought iron railings, French doors, and low-pitched roof. Another good example of the Mission Revival is the house at 3311 Woolworth designed by John McDonald. The Arts and Crafts movement was an all-encompassing design epic that included not only architectural design, but also the design of decorative arts, wallpapers, and paint schemes. The Arts and Crafts movement became popular thanks to the writings of designers like William Morris and Frank Lloyd Wright and was widely accepted by the American public through the wide ranging infiltration of publications like Good Housekeeping and House Beautiful. Although there is no set design vocabulary or form the Arts and Crafts movement most commonly manifests itself in the applied details of widely overhanging eaves, exposed brackets, and an overall horizontal scale and massing of the buildings. Arts and Crafts details are most commonly found in the Field Club neighborhood on simple foursquare plans and smaller scale cottage type homes. 3328 Pine Street built in 1915(pictured) has low sloping side gable roof with off center entrance and large glassed-in sunroom expanse on the main façade. The massive front gabled dormer gives the appearance of a cross-gabled plan. Building is clad in stucco and ornamented with half-timbering on the large dormer. The prerequisite exposed brackets are present. 1123 S 35th Avenue built in 1922 for the J. Happe family has a small scale off center entrance with large brackets, truncated columns and jerkinhead roof on both the porch projection and the gable end façade. The building is clad with stucco façade. This is a small-scale 1-1/2 story house. 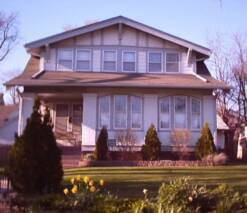 Next to the American Foursquare the Bungalow was one of the most popular building styles not only in Nebraska but also across the country. The term bungalow is more commonly used to describe a small scale one to one-and-a-half story house, and not necessarily a building style. However, the terms are considered almost interchangeable. Craftsman bungalows were one of the most prolific styles for smaller houses through the 1920s. Although developed in California, the style infiltrated the country through wide availability in catalogs and pattern books. High style versions of these houses are found in California, and are mostly credited to the architects Greene and Greene. These houses have low-pitched gabled roofs with wide open eave overhangs with exposed roof rafters, decorative beams and braces and large porches with heavy tapered columns. One of the best examples of this style is located at 1315 36th Street (pictured) was built in 1912 and designed by F. Birens. This home employs classic bungalow lines with low-pitched roof, battered piers on a brick porch with stucco walls and exposed brackets. The roof has wide overhanging eaves, which help to provide a very low silhouette. This house is the truest representative of the bungalow style in the neighborhood. The Prairie School was generally popular between 1900 and 1920. Architecturally it is defined by its low-pitched roof with widely overhanging eaves, porches and cornices, eaves, and façade ornamentation that emphasizes horizontal lines. Heavy short columns often support the porches. The Prairie School is recognized as one of the few styles developed in this country and not based on European antecedents. Frank Lloyd Wright is considered the father of the style especially through many of his early works. Prairie style buildings relate well to their surroundings and have heavy horizontal massing. 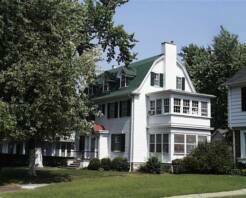 The only Prairie School house in the Field Club neighborhood is located at 3540 Pine Street. 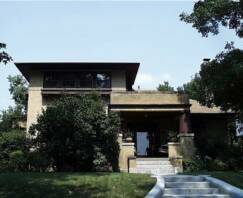 It was built in 1923 and designed by Charles Rosenberry for the Wilkerson Family. It consists of two different horizontal levels that are defined by a low-sloping pyramidal roof. Squat columns support the partial width projecting flat-roofed porch. This projection helps define the horizontal feel of the building with ornamental banded windows at the second story level to help the adjacent roofline appear more flat. Though many of the foursquare homes have Prairie School details this is the only high style Prairie School house in the neighborhood. 3301 Walnut was built in 1915 by the building firm of Norris and Norris. This house represents the typical box plan with a full width porch pyramidal roof and central dormer. The symmetrical façade has boxed eaves and an off-center entrance that is not visible from under the heavy porch roof. Other examples that employ these same details include homes at 1304-1326 South 35th Street, 1314 and 1320 35th Avenue, 3301 Hickory Street, 1117 and 1119 36th Street, and 1116 Turner Boulevard built in 1914 was designed by Walter Petersen. Notable architects on some of the foursquare homes include F.A. Henninger at 1304 35th St., 1314 and 1318 and 1326 35th Street and W. A. Misener at 1306 35th Street and John McDonald at 3303 Woolworth, Fisher and Lawrie at 1320 35th Avenue, 1313 Turner Blvd and 1320 Turner, William Steele at 1342 S. 35th Avenue, F.W. Krelle at 1322 35th Avenue, J.J. Davey at 1306 35th Avenue, Joe Lootens 1316 33rd Street, G.W. Garloch at 1618 33rd Street, E. Skagman at 3333 Pine Street, T.A. Campbell at 3533 Pine Street. This extensive list illustrates that even though this was a common house type it was employed not only by the design/build companies, but also by well-established architects. Norris and Norris a large Omaha building contractor in Omaha built an entire block of Foursquare at the 3300 block of Walnut Street. The small-scale English Cottage or Minimal Traditional style was prevalent in this neighborhood after World War II. However they were commonly built throughout the city in the late 1920s and the early 1930s prior to the cessation of construction due to the nationwide depression about to impact the city. These small cottages are primarily of brick construction, generally one-and-one-half stories with steeply pitched roofs ceasing in a curvilinear arc close to the main central entrance. Generally off center entrances were built with arched doors, and quite often enhanced by slightly projecting brickwork to enhance the vertical nature of the house. In the Field Club this building type is primarily found in one cohesive cluster near the school on Walnut Street with few individual examples on later developed lots. Given the dates of construction it is evident these houses were built to accommodate GIs returning from their war service. 1106 Turner Boulevard (pictured) is the most highly ornamented formal example of the English Cottage in the Field Club neighborhood. The 1-½ story brick house was built in 1921and designed by the Henningsen Engineering company for the W.C. Humphrey Family. Although this house conforms to the building standard with its small scale, steeply pitched roof, and brick construction, it surpasses most of the pattern book design as is evident by the diapering pattern in the brick work, the matching garage, and the elaborate green tile roof. The 3500 block of Walnut Street is located immediately adjacent to the Field Club Elementary School was developed in two phases. Beginning in 1929-1933, four houses were constructed in this style. The summer of 1944 saw the completion of this block with the construction of the remaining seven houses. In July, the Freeman Construction Company in consultation with the architect Charles Stinman built five of the houses. 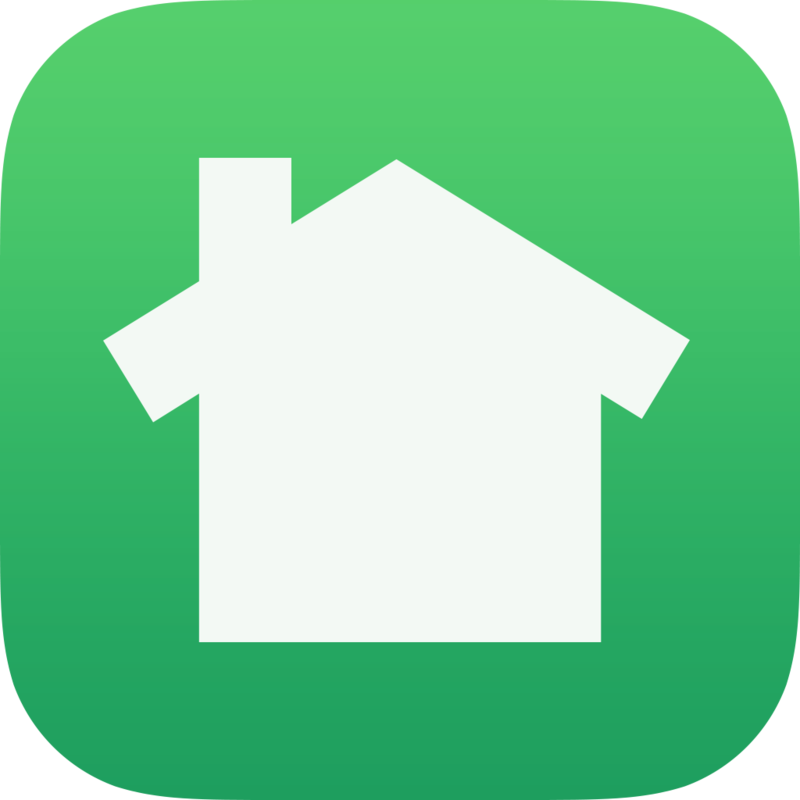 From August through September two other homes were completed by builder/contractor R.G. Freeman. All of these homes are similar in scale, style, and materials. The one exception is the house located at the very end of the block, which was built in 1962, however it is similar in materials and size and meshes well with the rest of the block. The International Style of building is somewhat rare in residential construction in Nebraska. The style is typified by flat roofing usually without any ledges, large windows that are set flush with the walls with little molding or detail, and an asymmetrical plan. Generally this style will have simple smooth stucco or concrete walls, however it is not usually to see smooth board walls. Cantilevered projections, balconies, and large expanses of glass accent the asymmetrical facades. This style became popular around 1925, however the style did not become prominent until at least the 1930s with stylish suburbs in the northeast adopting the most modern building techniques. A more widespread vernacular style that retained the ornamental details of the International Style became popular across the country after World War II. This phase of stylistic development is referred to as the Contemporary style. There is only one house of this style in the neighborhood and it is located at 1801 33rd Street (pictured) and was built in 1947 and designed by the architect John Townsend for himself. The building is a banked two-story building with a flat roof, and large multi-paned steel windows. The roofline has a curvilinear edge accenting the asymmetrical nature of the façade. The Art Moderne/International 1801 33rd Street built in 1947 designed by John Townsend and built for himself, simple two story flat roofed structure with curvilinear roofline large windows and awnings. The modern Ranch style house first originated as many styles did in California during the late 1930s however did not reach its peak in popularity until well after that becoming the most popular building type during the decades of the 1950s and 1960s. These houses are one story sprawling buildings with low sloping roofs and attached garages. The picture window made its first appearance in the ranch house. Expansive lots were used to accent the horizontal nature of the home and since automobile transportation and not historic trolley car lines was popular thus making their spread out location was not an issue. Ranch houses were constructed with almost every type of material from brick to wood siding, to stone. Primarily asymmetrical facades were accented with large windows and off-center doors. The Field Club neighborhood has only a few Ranch style homes, but those that are present illustrate their style quite well. Two examples of are the houses at 1321 South 36th Street and 1818 33rd Street. Although no building permits were found for either of these houses it is a logical assumption they were both built in the decade of the 1950s. 1321 South 36th Street is a one-story house with a low-itched hipped roof and large window facing the street with the primary entrance located to the south side of the window. Both of these houses would be considered infill housing because they were built after most of the neighborhood was already complete. In order to accommodate the modern rambling floor plan and design the house was reoriented so the length of the building extended back from the street-facing portion of the lot. The house at 1818 33rd Street is a slightly smaller cottage type example and probably dates from the late 1950s to the early 1960s. It is a one-story wood frame building with gable roof and a central entrance. This is a good example of the more modern infill housing primarily completed in the 1940s for post war housing. The remainder of the houses in the neighborhood represents eclectic building styles with a very few buildings constructed as multi-family units. There is a multi-family unit at 3303 Poppleton built in 1910 and designed by Lloyd D. Willis. This is a large two-and-a-half story structure with multiple entrances, a large gable roof and a stucco finish. It represents minimal Arts and Crafts details with some visible half-timbering details under the overhanging eaves. This along with a duplex on 1100-1102 South 35th Avenue, apartment buildings at 3221 Woolworth and 1612 S. 32nd represent the extent of the multiple family dwellings within this district. The Field Club Historic District represents a wide variety of architectural styles and is the most intact district yet documented in the state. Of the 312 buildings within the district only nine do not contribute resulting in a 98% contributing to non-contributing ratio.